The morning commute should be unaffected until about 8 or 9 a.m. The heaviest rain will be between 1 and 4 p.m.
Storm Team4 is calling Tuesday a weather alert day. Hopefully you’ve been lucky enough to stay warm and dry today-- a steady, cold rain has been falling for most of the day. Skies haven’t been totally clear for this evening’s commute, but the rain should let up around 9 p.m.
Because of the storm's potential for high impact, Storm Team4 declared Tuesday a Weather Alert Day. Cold rain, mixed with a little sleet, moved into areas in and around D.C. about 8 a.m. Tuesday. The freezing rain and sleet was mostly mixed with rain and didn't cause any major issues for commuters, Storm Team4 meteorologist Lauryn Ricketts said. The wet weather should continue until well after rush hour. 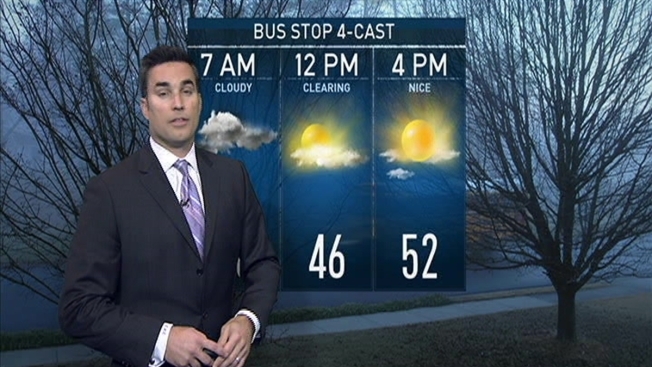 The weather at the bus stop Wednesday morning should be dry. However, in parts of southern Maryland, showers could continue into the night. The nasty weather continues later this week, however. Storm Team4 is also calling Friday a Weather Alert Day because of extreme cold.